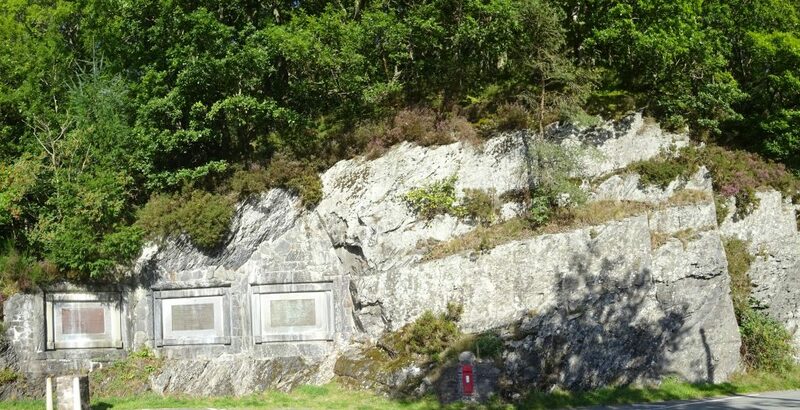 The South-western Berwyn Mountains: Folding, Over-folding and Possible Thrust Faulting in the Allt-tair-ffynnon and Pen Plaenau Siltstone Formations of the Lake Vyrnwy Area. Photo 27 (above). 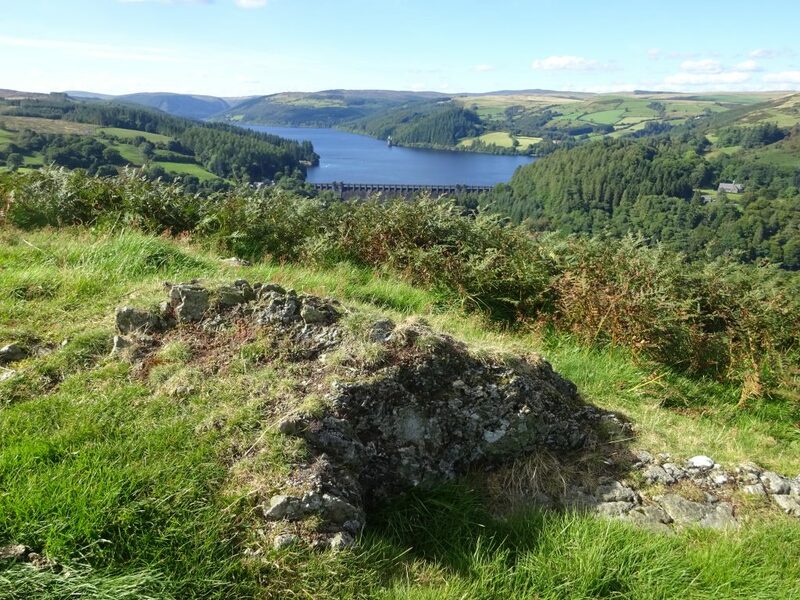 The beautiful blue waters of Lake Vyrnwy lie at the south-western end of the Berwyn Mountains. The rocks along the ridge of Craig Garth-Blwch, seen in the foreground (siltstones of the Allt-tair-ffynnon Formation) not only provide spectacular views over the lake, and to the mountains of Mid-Wales beyond, but are also interesting in their own right, in that they appear to dip to the north-west, towards the lake. However, in actual fact this is not the case. In reality, they have been steeply folded, and actually ‘overturned’ within the south-eastern limb of a steep anticline structure, which extends south-westwards from the south-western end of the Berwyn Dome (see geological map on back cover). So at this location older strata lie on top of younger strata; the opposite of what we would normally expect. Photo 28 (above). Near the dam wall of Lake Vyrnwy thick beds of the Allt-tair-ffynnon siltstones dip westwards. However, at this location they are the ‘right way up,’ i.e. younger rocks lie on top of older rocks. This is because here they are on the north-western limb of the anticlinal fold, and have not been overturned. Photo 29 (above). Looking north-east along the ridge of Craig Garth-Bwlch, towards the hills of Rhialgwm and Pen-y-Bylchau, right background. 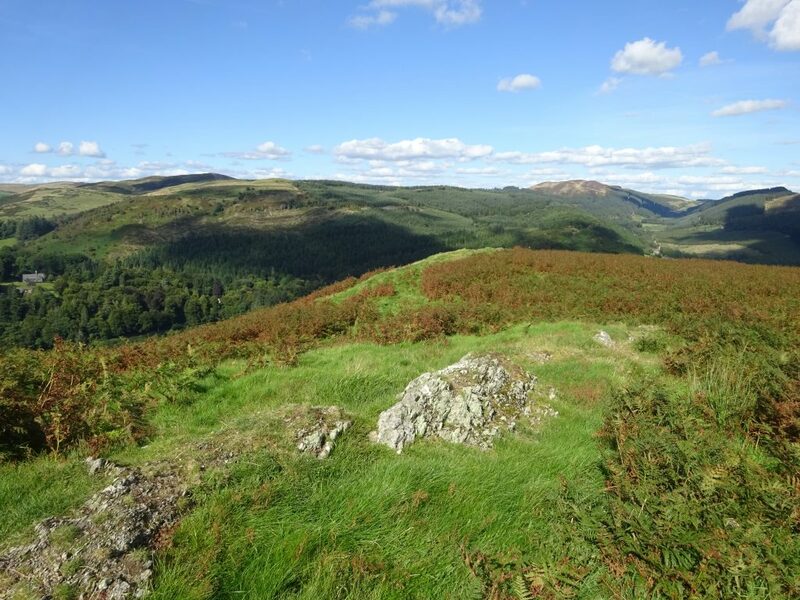 Both these hills form part of the steeply folded, to overturned (and possibly thrust faulted) southern limb of the large anticlinal fold that extends southwestwards from the main Berwyn Dome structure.